Despite being the second most populous island in Europe with over 6 million people, Ireland still has a lot of pristine countryside and diverse landscapes to explore. There’s no better way to visit the rolling hills, craggy coastlines and shimmering lake countries, than by hiring a car and driving yourself (check out Alamo.com for deals). As with any nationwide road trip, it’s best to have a few routes planned before you head out. Here are 5 road trips in Ireland that simply can’t be missed. This 2,600 km long drive takes you past dramatic coastlines, dozens of historical landmarks, forgotten farmlands and into some of the most scenic terrain that Ireland has to offer. The Wild Atlantic Way connects Donegal to Cork, winding from the Inishowen Peninsula in the north, down to the picturesque town of Kinsale in the South. Known as the world’s longest touring route, this drive takes in some wonderful culture along the way as well. You can stop at enchanting villages and get to know the local people, taste the regional foods and enjoy some craft beer at the pubs. A thick haze sometimes blankets the road on this drive, but it only adds to the enchanting mystery of this spellbinding part of the country. Don’t miss it! Also known as “the purple drive”, this 86 km route is set on the north-western corner of Clare County and is bordered by both the rough and wild Atlantic Ocean, and the more sedated waters of Galway Bay. You’ll start in Kilfenora, passing through Lisdoonvarna as you head up the jagged shoreline towards Black Head, before eventually looping back down towards Carran and then returning to Kilfenora. The Burren is a fascinating landscape of rock gardens and unforgiving cliffs that crash down into the sea beside the highway. The area extends over more than a hundred and fifty square kilometers and almost all of it is made up of barren, chalky limestone. Don’t miss the little lighthouse just below the road outside of Black Head where you can get a glimpse of the mist-shrouded hills of Connemara that lie just across Galway Bay. A great first drive for anyone landing in the nation’s capital, this drive is a truly magical tour across Ireland. Your first stop will be the Martello Tower in Dublin, then you’ll pass by the 13th century Trim Castle which is definitely worth a visit. Your final stop will be the lovely town of Galway, but make sure you stop at Atherny Castle and the enchanting walled town that surrounds it before you end your trip. This old military road was once the place where British Armed Forces flushed rebels into the hills, but today it is known as one of the most scenic drives in all of the Europe. You can start the drive in Dublin and loop all the way back after making the pass at 552 m.
The entire drive offers spectacular panoramic views of the blanket bog and the imposing Wicklow Mountains. The route passes though the mountains and past the Glencree valley, the inky waters of Lough Tay, Glenmacnass Waterfall and Kippure Mountain. Make sure you stop at the Glencree’s Visitor Centre, a building originally constructed to house soldiers who were guarding the pass, and the Glencree War Cemetary, a quiet resting place for German soldiers who died on Irish soil. Get ready to experience panoramic seascapes, rugged cliffs, pristine bays and forgotten coves on this incredible seaside drive. Just 40 km long and connecting the towns of Dungarvan and Tramore in Waterford, you’ll pass through quaint villages like Boatstrand and Dunhill before arriving at the seaside resort town of Tramore. The Copper Coast and its intimidating rock formations took over 450 million years to form and the vast and undiscovered topography deserves many stops to really appreciate it. Give yourself plenty of time to pullover and take photos, this is truly one of Ireland’s hidden gems. 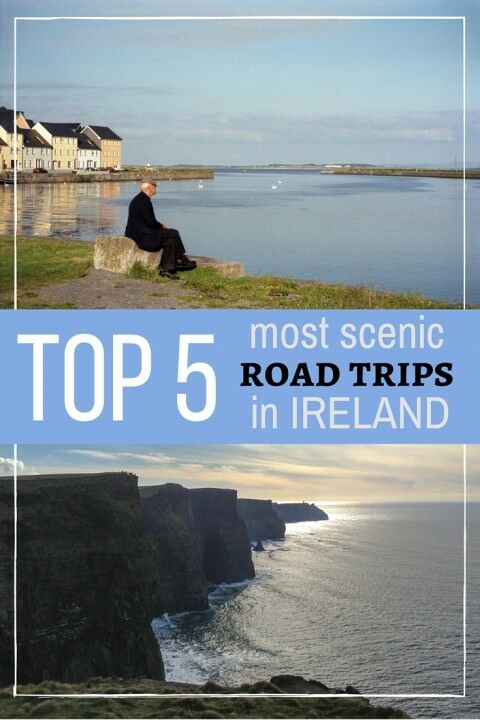 Ireland is a road trippers dreamland with literally dozens of impossibly scenic drives to choose from. You won’t be able to hit all of the best roads in one trip to the country, but you can certainly pick up a map, take advice from the locals and try to explore as much of the misty countryside as possible. Consider getting a GPS as well. Most roads are well-sign posted, but if you’re trying to do multiple drives in a short time, a navigation system can save you frustration. I was in Wild Atlantic Way two years ago and fell in love. So green, so rush, so rich! I can’t wait to go back! Ireland is NOT a part of the UK and although your little mistake seems insignificant – It is something that would put Irish people off reading your blog! We absolutely hate being lobbed into the UK. It’s the same as saying Canada is part of America. Ireland is NOT the UK…. Fixed. Sorry for the mistake. I just meant that it’s nicer than many drives in the UK. Should have been worded differently.